A man jailed alongside "sadistic" triple killer Joanne Dennehy is to appeal against the length of his sentence. 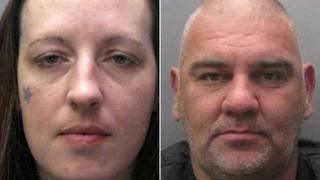 Gary Stretch, 48, was found guilty of attempting to murder Robin Bereza and John Rogers in Hereford, in April 2013. He and Dennehy had sought out the two men at random after she had already killed three men in Peterborough. Stretch, from Peterborough, who stands 7ft 3in tall, was sentenced to life with a minimum of 19 years in February. He was described in court as being a fearful "nodding dog" to Dennehy, who herself was described by police as a "sadistic serial killer with a fearsome personality". Dennehy murdered Lukasz Slaboszewski, 31, Kevin Lee, 48, and John Chapman, 56, in March 2013 before dumping their bodies in ditches near Peterborough. Following the murders she and Stretch went on the run ending up in Hereford where, on 2 April, Dennehy stabbed Mr Bereza, a 64-year-old former fire service worker. About 10 minutes later she went on to stab 56-year-old Mr Rogers. During the trial, the court heard Stretch had driven Dennehy around the town as she looked for more victims. Stretch's case will be heard at the Court of Appeal on Friday. This will be the second time Stretch has attempted to get his sentence reduced, after his first bid was rejected.